Set official Amazon, Inc. as the default seller on Amazon.com. Automate and no more manually switching sellers to Amazon needed. Then, look no further: Loyal Smile™ is your solution! It automatically selects Amazon, Inc. as the Default Seller on Amazon.com. Automate and no more manually switching sellers to Amazon needed, which may even help avoid accidental/counterfeit purchases from third parties! For example, see this warning from Apple in ABC News. And from manufacturers directly, like this official Samsung comment to an affected Amazon review. Just install it and off you go easily shopping from official Amazon, always*. That's thanks to Loyal Smile's sophisticated and intelligent approaches, such as being automatically compatible with Amazon Smile and search pages with complex filters. Moreover, whenever you change your mind and decide to purchase from third parties, you can do so easily: this extension gives you the option to disable the automation on specified/all pages and go back to let Amazon decide—so you're always in complete control. 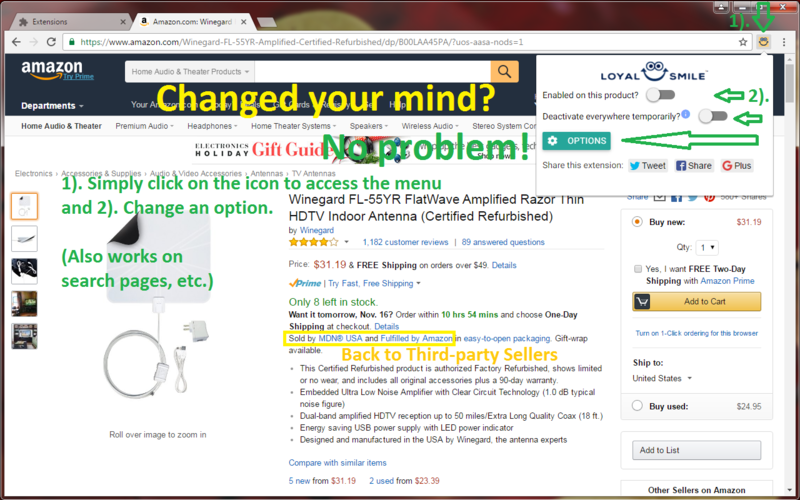 Simply click on this extension's icon next to the address bar while you're on an Amazon.com page to access the menu. 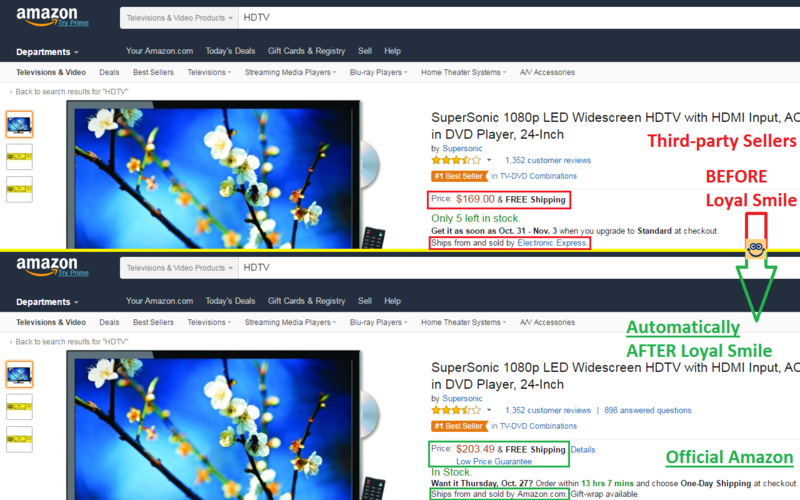 A bonus side effect: By using this extension, you can more easily and consistently obtain official Amazon prices that are needed to price match to/from the prices of Amazon's many competitors that may have Low Price Guarantees. You can also submit requests to Amazon that may get honored, but they don't guarantee it for non-TVs & it may not work for all items/in the future. *Please note: Loyal Smile is still in beta. Although most functions work as they should, it may not work completely all the time. Controls to disable it are easily available as mentioned, built-in. I continuously use and monitor this extension's accuracy myself, which ensures it always works at least on some of the most common of Amazon page types. I'm available to respond to your complaints and bug reports via this extension's "Support" tab or email—shown inside the extension's Options. In addition, here's my current TO-DO list for known problems and goals (as well as version change logs). Alternatively, please consider subscribing to be alerted once a stable version has been released. You can tell your loyal customers to easily whitelist your product page by turning off the "Enabled on this product?" switch in the interface while they're on your product page—or deactivate the extension entirely for the current browsing session—as shown on the last screenshot. Users can also directly enter the URL/ASIN in the Disabled Products Manager under Options. Further, I have plans for future releases to enable users to be able to whitelist—or even prioritize—all products sold by specific third-party sellers. The key point of this extension is to simply give full control and choice back to the rightful customer/user. Loyal Smile is built with integrity, and keeping your trust is more paramount to me. As such, I don't use underhanded tactics that may be used by other browser plug-ins that work with Amazon. For instance, this extension does not surreptitiously redirect or manipulate your browser to gain Amazon affiliate profits—which is strictly prohibited by Amazon. So, you can safely use this extension while still preserving original affiliate links that you may have carried over from, for instance, your favorite content creators, and 100% would still go to them. Further, this extension does not steal/record personal information nor sell them to third-parties, which, unfortunately, may be another common practice with many other free extension/software out there. As such, due to my limited resources and being the sole person developing and managing this entire extension, I only ask that if you do enjoy this extension, to please consider supporting its further development by checking out the donation/purchase avenues provided on the "Support + Upgrade" tab within this extension's Options menu. Even simply providing me with feedback, sharing the word about this extension and/or leaving a positive (e.g., 5-star) rating on the Web store listing would be very helpful as well. Thank you for your understanding and support for indie development! Keep up to date with the latest news, including Loyal Smile updates—and announcements when it's stable & out of beta—by liking my (UNIoSOFT's) page on Facebook or following me on Twitter or Google+. 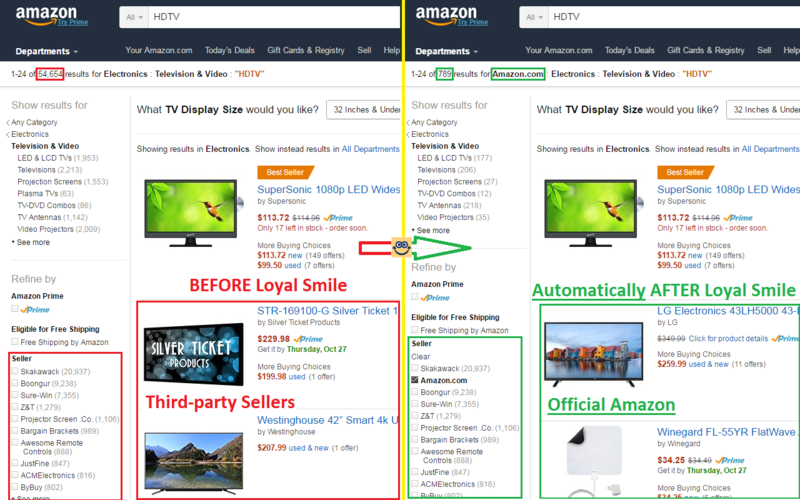 Loyal Smile™ is not affiliated with Amazon.com, Inc. Amazon™ and the Amazon logo are trademarks of Amazon.com, Inc. or its affiliates. Loyal Smile, its logo, and its slogan are trademarks of UNIoSOFT™. © 2016-2017 UNIoSOFT. Website by SmartWebs.co division.